Studio Line: Warner Bros. - In the heart of suburbia, a hit man with heart has just moved in. There goes the neighborhood -- in a pine box. When hit man Jimmy "The Tulip" Tudeski moves into a comfy suburb, everyone's suddenly in danger of pushing up daisies. And it's not all Jimmy's doing, either. Jonathan Lynn (My Cousin Vinny) directs and a top cast packs heat in this manic comedy about life, love and plenty of ammo. Bruce Willis is Jimmy, whose arrival sparks a chain reaction in which just about everybody wants to clip somebody else. Matthew Perry plays a hapless dentist who finds a way to get on the Tulip's good and bad sides. And Rosanna Arquette, Michael Clarke Duncan, Natasha Henstridge, Amanda Peet and Kevin Pollak add to the wacky and whacked fun of "a laugh riot" (Larry King, USA Today). Box Office: Budget: $24 million. Opening Weekend: $15.915 million. Gross: $57.262 million. DVD: Widescreen 1.85:1/16x9, standard 1.33:1; audio English DD 5.1, French DD 5.1; subtitles English, French; closed-captioned; double side - single layer; 25 chapters; rated R; 99 min. ; $24.98; street date 7/18/00. Supplements: Feature-Length Audio Commentary by Director Jonathan Lynn; Interview Gallery with the Cast; Filmographies; Theatrical Trailer. The Whole Nine Yards presents the tale of two TV actors. No, that's not part of the movie; its story concerns "Oz" (Matthew Perry), an unhappily-married dentist who gets a new next-door neighbor in the form of hitman Jimmy "the Tulip" Tudeski (Bruce Willis). Entanglements, complications, and (hopefully) hilarity ensue. Each main cast member of TV's Friends has tried to make the leap to the big screen, and all of them have largely failed to achieve success. Of the bunch, Courtney Cox has appeared in the most popular films since she was in the whole Scream trilogy, and both Lost In Space, which featured Matt LeBlanc, and Analyze This, with Lisa Kudrow, did decently. However, none of the actors played the lead in any of those movies, so their mettle wasn't really tested there. It's as lead actors that the Friends have encountered the most difficulty; not a single movie in which any of them played one of the top roles has been anything other than a bust. Well, not a single movie until TWNY, at least; while it wasn't a huge hit, it did decently and may represent an end to the Friends curse. What made the project interesting to me was the juxtaposition of Perry with Willis, who also comes from a TV background. Moonlighting was so long ago and Willis has become so famous since then that it's weird to think of him as a "TV actor", but he does represent one of the few who made a successful transition from small screen to big. Maybe Willis can give Perry some pointers, the first of which should be "act in a way that makes your movie character at least remotely different than your TV personality". I won't say that Oz and Chandler are the same character, but they're pretty similar, and Perry plays both exactly the same way, with identical line readings and mannerisms. Perry can be a funny guy, but I must admit I didn't like his performance just because of this "deja vu" factor. I don't insist that the guy be a "chameleon" and seem completely different in every role - he doesn't have that ability anyway - but some differences would be nice. Despite this flaw, TWNY offers a generally amusing and entertaining film. This is one of those comedies that you see, you enjoy to a mild degree, and then you move on with your life. It's exactly the kind of fare perfect for wasting time when you're flipping channels; you can get into it at any point, watch it for a while, get a few giggles, and leave it at that. It's not exactly something that will provoke lengthy conversations afterward; it ends, you'll say "that was cute" to someone, then you grab a bite to eat. There's nothing wrong with that, but you definitely shouldn't expect a movie that provides more substance. 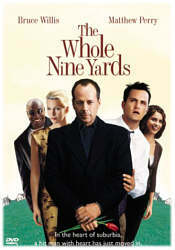 The Whole Nine Yards is a pleasant film that's generally well-executed and enjoyable but it doesn't offer anything more. I had fun while I watched it but I don't expect to think much about it in the future. The Whole Nine Yards appears in both its original theatrical aspect ratio of approximately 1.85:1 and in a fullscreen edition on this double-sided, single-layered DVD; the letterboxed image has been enhanced for 16X9 televisions. Only the widescreen side was screened for this review. Although it displays a few small weaknesses, the movie offers a generally positive picture. Sharpness seems pretty crisp and clear for the most part, though a few medium to wide shots display mild softness; these scenes don't look terribly fuzzy, but some haziness occurs. Moir� effects appear on occasion - Rosanna Arquette wears a blouse early in the film that has some issues -and I detected moderate artifacts from the anamorphic downconversion on my 4X3 TV. Print flaws included a few nicks and speckles and some minor grain at times; these aren't huge problems, but they were more prevalent than I'd expect of such a new movie. Colors seemed largely accurate and realistic. This isn't a film with a bold palette, but I found the hues to appear satisfyingly true to life. Black levels looked adequately deep and dark, and shadow detail was appropriately heavy without any excessive opacity. TWNY doesn't look as good as I'd expect a movie from 2000 to appear, but it offers a perfectly solid image nonetheless. Much better is the film's terrific Dolby Digital 5.1 soundtrack. The soundfield appeared surprisingly active for a comedic effort. The forward speakers provided vivid imaging that seemed realistic and managed not to be too "busy", and it kept the action brisk while it meshed the audio together nicely. The surrounds kicked in with solid support. Only a few true uses of the split surrounds occurred, but they seemed impressive, and the other reinforcement from the rears sounded bold and rich. The fine soundfield works so well largely because the quality of the audio is so strong. Dialogue occasionally appears dubbed, but it usually seems warm and natural, with no issues related to intelligibility. Effects are clean and realistic, and when appropriate - as with planes flying or explosions - they display some fantastic bass. The low end comes through even more strongly during the film's music, when sounds crisp and taut; the different tunes and the score seem dynamic and the bass will give your subwoofer a surprising workout. Although it's good, the soundfield lacked the ambition to qualify for a true "A" rating, but the whole package earns a very strong "A-". The Whole Nine Yards isn't billed as a true special edition, but it includes a few supplemental features. First up is a decent audio commentary from director Jonathan Lynn. Overall, the piece is a bit spotty and nothing special, but Lynn manages to offer enough interesting information to make it worthwhile. In particular, I enjoyed his comments about material with was altered from the script and also his statements about the ways he and the cast refined the humor in the film. Lynn provides some compelling details at times. Next is an "Interview Gallery" which provides sound bites of various lengths from five members of the cast - Willis, Perry, Michael Clarke Duncan, Natasha Henstridge, and Amanda Peet - plus Lynn. These range from 75 seconds for Duncan to three minutes for Perry; all in all, they run a total of 13 minutes and 10 seconds. These clips are nothing special, as they tend toward the usual puffy talk we hear about how great everybody was; Perry tries to be witty by telling us how helpless Willis was, but he doesn't really succeed. The snippets are watchable but bland. Finally, the DVD offers a "Cast and Crew" page. Unlike most of these packages, this section provides no biographical information. It just lists the names of the participants, which makes it rather pointless - isn't that what the film's credits do? We also get the movie's theatrical trailer. While I enjoyed The Whole Nine Yards, I didn't find that it offered any kind of particularly special thrills or hilarity; it's a completely workmanlike movie that provides a few laughs and a little fun but nothing more. The DVD presents generally good picture with terrific sound and a couple of decent supplements. TWNY is the kind of film that might make for a nice "lazy weekend" rental but that's about it.